It has been relined with plain cotton cloth. 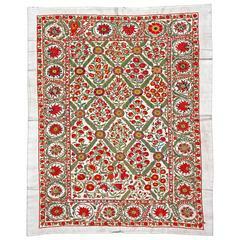 Suzani is almost never used condition except the chewed up corners that has been damaged from its being hung on a wall. The piece has no lining but we could get it done upon request. 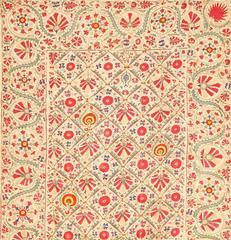 A vintage Uzbek Suzani (needlepoint) textile from the mid-20th century. 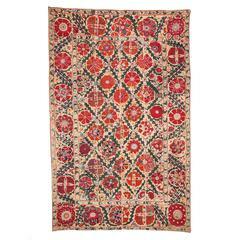 Nice antique Suzani from Uzbekistan with beautiful design and colors, silk embroidered on cotton foundation, good conditions. Pillow made from a 19th century Turkeman rug. Handmade vintage Uzbek Bukhara rug in original good condition. The rug made in soft shade of peach with the soft wool. 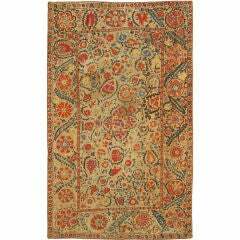 The rug has all-over design with repeating tribal ornaments.